promote a reference Euro-Asian centre on Chinese cancer prognosis – by spreading the knowledge and by raising awareness in China and European Union. Research activities were held in China in collaboration with the new European partners, in order to enhance current research activities of the joint institute and to create durable links between Chinese and European teams. Research was focused on immune phenotype as personalized medical biomarker for prognosis of Chinese cancer patients, and was extended to new types of cancer and biomarkers. These prognosis studies helped to guide clinical decision-making by facilitating the selection of appropriate treatment options. The enhancement of existing collaborations and encouraging the emergence of new partnerships. The enhancement of the research capacity of the FDUSCC-IM laboratory to conduct ambitious research activities. The necessary management of the project. Hosting European PhDs and post-doctorate research fellows in the joint institute. Hosting summer schools and seminars in Shanghai. The second work-package plans to create optimal conditions to host young and fellow researchers, enhancing the research capacity and the competence transfer to the joint institute by providing adequate and gender-balanced human resources as well as equipment to conduct beyond the state-of-the-art oncology research. The third work-package focuses on the scientific activities resulting in an increased European involvement in the joint institute. In order to strengthen and expand the joint institute as a Euro-Chinese leading laboratory in cancer prognosis, current research directions will be pursued and new investigations will be jointly developed leaning on European partners’ expertises. Research activities will be organized around 6 topics, each being addressed by various partners of the project, according to their expertise field. Promoting the joint institute and raising awareness on cancer prognosis research in both China and Europe. Organizing in Shanghai a final international conference on personalized markers for cancer prognosis. The fifth work-package will be in charge of IMMUNOCAN coordination, management and administration, essential tasks in an international collaborative project. 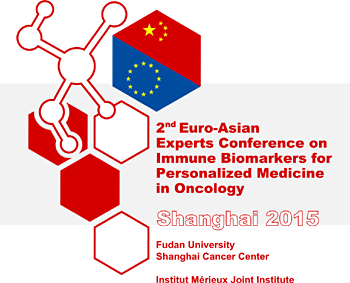 The 2nd Euro-Asian Experts Conference on Immune Biomarkers for Personalized Medicine in Oncology will take place in Shanghai on November 12-13, 2015. Chairs: professor Laurence ZITVOGEL (Institut Gustave Roussy, Villejuif, France) and professor Xuetao CAO (President of the Chinese Academy of Medical Sciene, Beijing, China). 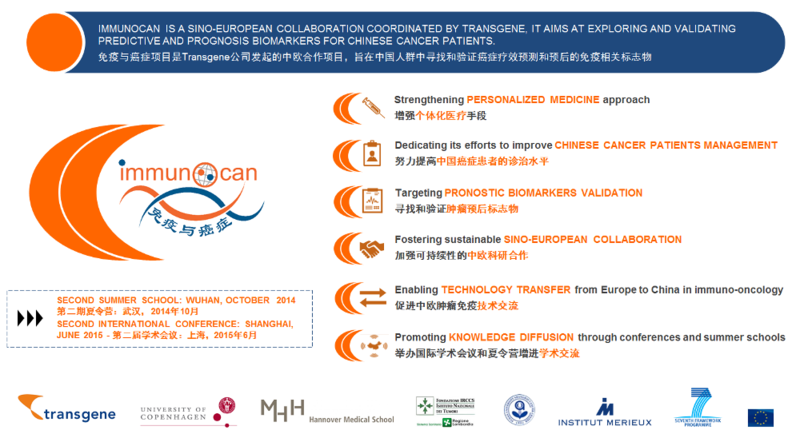 Co-chairs: professor Zhimin SHAO (Fudan University Shanghai Cancer Center, Shanghai, China) and doctor Romain Micol (Transgene, Strasbourg, France). Session 2: A recipe to reactivate immune surveillance? Session3: How to break tolerance and to shape patient immune system? 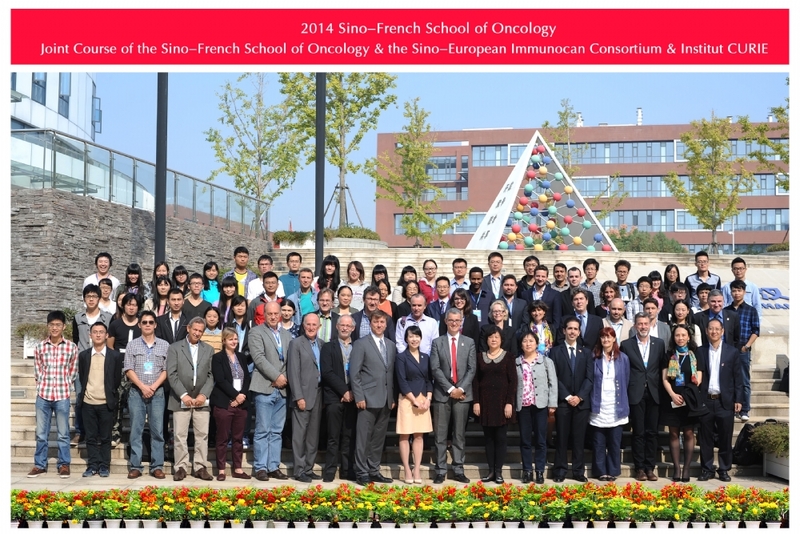 The second IMMUNOCAN Summer School takes place in Wuhan from 15th to 17th October, 2014. You can find more information on http://www.biopole-sinofrancais.com/html/industry/3650.html. Visit of FUSCC-IM by Yves Lévy (CEO, INSERM) and Philippe Arhets (International affairs, INSERM), July 1st 2014. IMMUNOCAN is participating to the symposium « Enseignement supérieur, recherche, innovation - La coopération Franco-Chinoise en mouvement », June 19th-20th 2014 in Beijing. 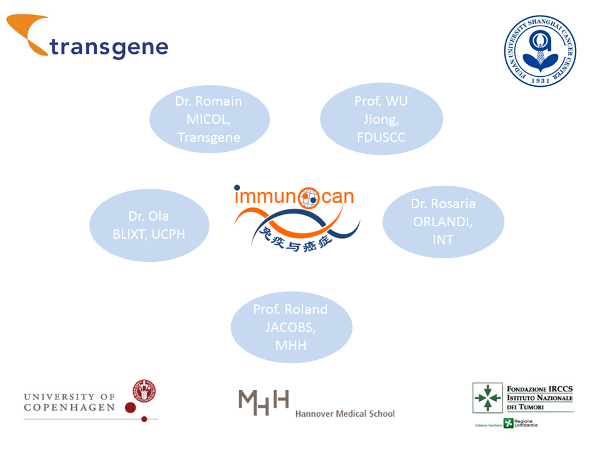 Presentation of IMMUNOCAN to the Nordic Center, a collaboration platform between Scandinavia universities and Fudan University, January 8th 2014 in Shanghai. IMMUNOCAN network announces the launch of the IMMUNOCAN Young Investigator Award 2013. Recognize and reward early career scientists for research excellence and potential on immunology and oncology. See full details (PDF). 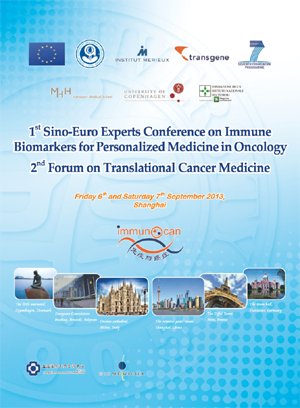 The 1st Euro-Asian Expert Conference on Immune Biomarkers for Personalized Medicine in Oncology – 2 nd Forum for Translational Medicine will combine the united effort of all partners organizations to continue positioning multidisciplinarity and personalized medicine as the ways forward to best improve the treatment of cancer patients. The European Delegation in China is planning to organize on November 13th 2012 (afternoon) and 14th (morning) the "First EU-China Joint Laboratories Workshop" to bring together representatives from joint laboratories operating in China. The 2012 IMMUNOCAN Summer School on Clinical Flow Cytometry provides a practical, in-depth, exposure to many aspects of flow cytometry. Flow Cytometry is a powerful tool in modern biology. The applications are numerous, and have contributed to many fields including by virology, immunology, and molecular biology. This course begins with introductory flow cytometry and progresses through development and design of multicolor panels. Afternoon sessions will include hands-on training in applications and training on FACS Canto II. More cutting-edge applications of flow cytometry will be presented. Informal exchange of ideas and the development of new contacts will be facilitated by a welcoming evening reception. The Immunocan website was created on January 2012 by Herve Hager and Benoit Heller, Transgene.